The 2 cats mentioned in previous news, Mable & Spike (Mable nearly lost her sight) have now been booked to go to a new home together – they are going to a nice house with a lovely big garden to play in. Mable’s eyes are much improved and her sight has almost returned. Thanks go to Dawn for making a yummy Christmas cake and donating other lovely prizes for our Christmas raffle; and to Brian of Ceres for the bottles of booze for the raffle. The raffle will be drawn on the morning of Christmas Eve so there are a only a few days left to get tickets (5 chances to win for £1)!! 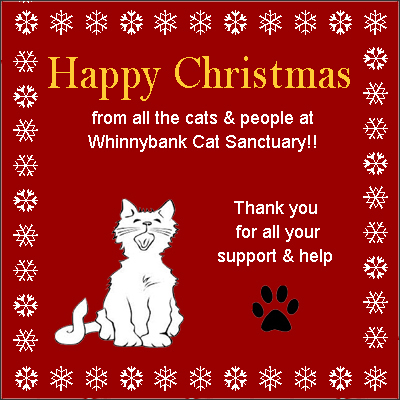 Thanks also go to Margaret Carstairs & the ladies of Crail sewing group for making us another beautiful quilt featuring cats to help us raise funds for the Sanctuary.